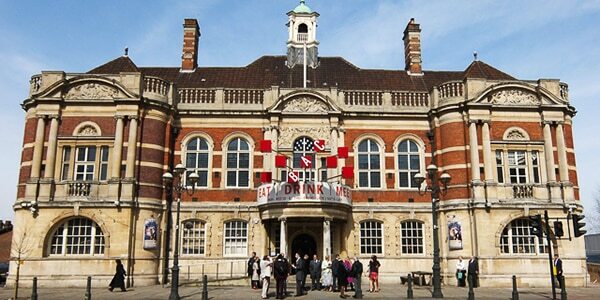 The BAC originally opened in 1891 under the name Battersea Town Hall, before being converted into a community arts centre (run by Wandsworth Borough Council) in 1974. In 1979, the centre became independent with the council providing a grant, with the theatre finally being founded in 1980. Since 2004, its artistic director has been David Jubb. The centre has played host to a number of famous productions including the premiere of Jerry Springer – The Opera in 2002 (before its transfer to the National Theatre), and Punchdrunk’s The Masque of the Red Death; an immersive production that utilised the entire building and ran for almost a year. As well as major theatrical productions, the centre showcases art installations, stand-up comedians, fringe plays, classes, workshops, and scratch performances (pieces shown throughout several stages of development where audience reaction influences how to work evolves).